32, 34, 36, 38 Raeburn Place. View from South West. Description 32, 34, 36, 38 Raeburn Place. View from South West. Scope and Content Nos 36 and 38 Raeburn Place, Stockbridge, Edinburgh Raeburn Place, a mix of tenements and villas, was built between 1814-25 on the northern boundary of a new Georgian housing development planned by the portrait painter, Sir Henry Raeburn, on his country estate in the village of Stockbridge. This double villa was typical of the villas with front gardens lining the street on its route 'out of town'. The arched doorpieces have recessed pilasters and semicircular fanlights. It was demolished to make way for Woolworths in 1962. 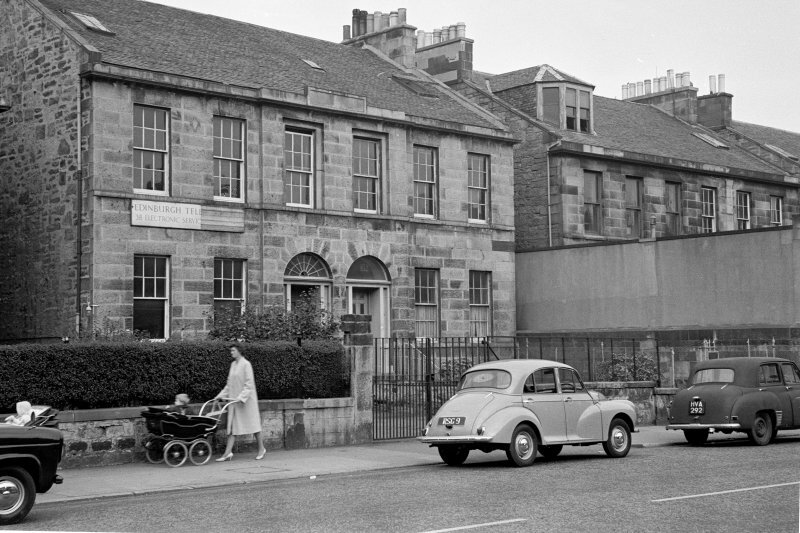 Raeburn Place is now Stockbridge's main shopping street, and the shops have all but obliterated what was originally built, although a number of attractive small houses still remain. Source: RCAHMS contribution to SCRAN.